1	Soak the wheat berries overnight in cold water, covering them 3 inches. Drain the water in the morning. 2	Boil the wheat berries in 6 cups of water for about 50 to 60 minutes, or until tender. Add more water as necessary to keep wheat berries covered during cooking. Drain excess water from the wheat berries when done. 3	In another small pot, boil 2 cups of water. Add the wild rice and simmer for about 45 minutes, or until the rice begins to split. I prefer to undercook the wild rice slightly so that it retains some structure. Drain excess water. 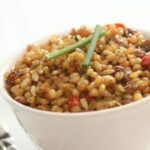 4	Combine the cooked wheat berries and wild rice in a large bowl. 5	Whisk the lime juice, honey, mustard, salt, and pepper to make the dressing. Add the dressing to the wheat berries and wild rice, mix thoroughly. 6	Now add the cranberries, cucumber, parsley, and green onions and combine well.